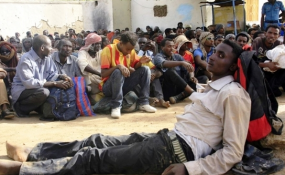 Tripoli, Libya/New York — Nearly a quarter of the more than 300 migrants and refugees held at the Sabaa Detention Center in Tripoli, Libya, are malnourished or underweight, including many children, the international medical humanitarian organization Doctors Without Borders/Médecins Sans Frontières (MSF) said today, sharing the findings of a nutritional survey. For more than two years, MSF has been providing medical care to refugees, migrants, and asylum seekers in detention centers in Tripoli, Khoms, Zliten, and Misrata. Detainees are not guaranteed access to medical care--it is provided by a handful of humanitarian organizations such as MSF or by UN agencies that manage to have a limited presence despite widespread violence and insecurity.